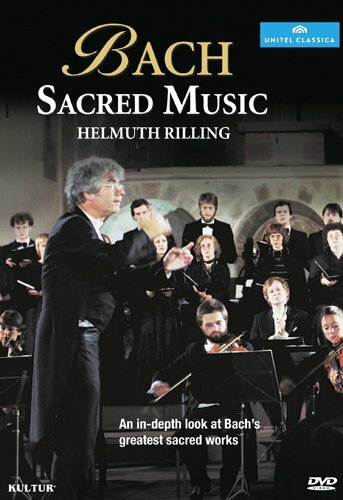 In Sacred, Helmuth Rilling conducts, and also plays the organ, as he examines J.S. Bach's greatest sacred music, with excerpts from Bach's organ chorales, oratorios, passions and cantatas. 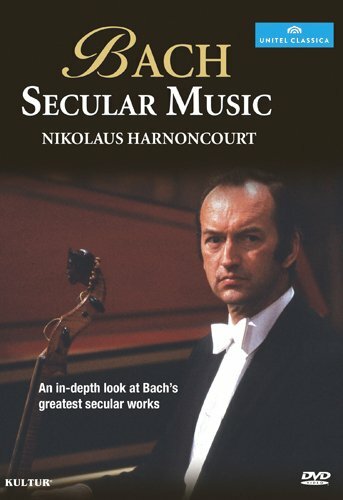 For Secular, Nikolas Harnoncourt interprets passages and movements from Bach's Orchestral Suite No. 3, the Brandenburg Concertos Nos. 3 and 5, Bach's arrangement of Benedetto Marcello's Oboe Concerto and parts of Bach's Coffee Cantata. Helmuth Rilling conducts, and also plays the organ, as he examines J.S. Bach's greatest sacred music, with excerpts from Bach's organ chorales, oratorios, passions and cantatas. In this program featuring excerpts from secular works by Johann Sebastian Bach, Nikolaus Harnoncourt strives to reveal something of the mystery and fascination of Bach's compositional art in the domain of non-sacred music. With his Concentus musicus Wien and the vocal soloists Janet Perry and Robert Holl, Harnoncourt interprets passages and movements from Bach's Orchestral Suite No. 3, the Brandenburg Concertos Nos. 3 and 5, Bach's arrangement of Benedetto Marcello's Oboe Concerto and parts of Bach's Coffee Cantata.